Zumba Spreading the Love Quikly Sweepstakes – Win a Zumba Cruise for 2! Win a Zumba Cruise for 2! ENTER SWEEPSTAKES HERE – Zumba Quikly Sweepstakes page. 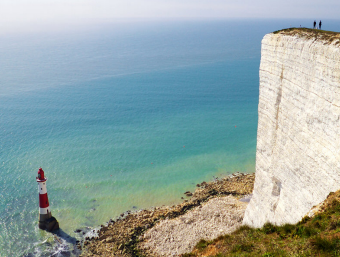 ENTRY LIMIT – Limit one registration per person. SWEEPSTAKES ENTRY PERIOD – The opt-in period begins on January 24th, 2018 at 5:00 a.m. Eastern Time (“ET”) and ends as soon as the live release in the Quikly campaign, which shall be no later than February 9th, 2018, at 11:59 p.m. ET but could end sooner. PRIZES – Fastest person: Scores all inclusive access to the Zumba® Cruise for 2, including airfare to the departing port of call. Two Tickets Aboard the Zumba® Cruise: One Winner will receive one Deluxe Balcony Stateroom for Winner and one guest on the Zumba® Cruise (“Cruise”) (US$2,838.00 value). Cruise dates are April 8 to April 13 2018. Winner will also receive round trip airline tickets for Winner and one guest to travel from an airport near a major U.S. city near Winner’s home to the departure point of the Cruise. If Winner has already paid for the Cruise ticket, he/she will be refunded the amount paid for the room and will be upgraded to the Deluxe Balcony Stateroom. The amount of the airfare will also be refunded if applicable. All flight details, including the time of the flight and the airline, will be determined by Zumba in its sole discretion. Winner is responsible for all taxes and governmental fees associated with the prize. Winner is also responsible for all cruise port fees and taxes (estimated at $219.17 per person). 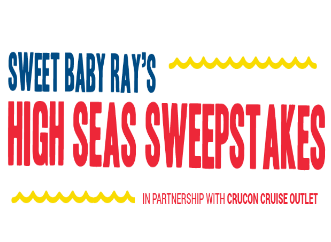 Sweet Baby Ray’s High Seas Sweepstakes – Win a Caribbean cruise! 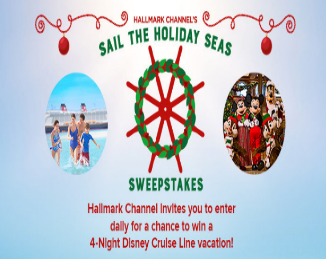 Win a Caribbean cruise for 2! ENTRY LIMIT – Maximum of one entry per individual entrant. ELIGIBILITY – The Sweepstakes is open solely to legal residents of the fifty (50) United States and the District of Columbia who are at least 21 years of age at the time of entry. SWEEPSTAKES ENTRY PERIOD – The Sweepstakes begins at 12:00 a.m. on January 4, 2018 Eastern Time and ends at 11:59 p.m. Eastern Time on March 21, 2018. PRIZES – One (1) prize will be awarded to one winning entrant (“Winner”). Winner will be randomly drawn after the close of the Promotion Period. The prize is a cruise for Winner and one (1) guest on the Royal Caribbean Harmony of the Seas 7-night Western Caribbean itinerary in one (1) Junior Suite stateroom, sailing November 3, 2018. Stateroom chosen by Royal Caribbean, no changes. (Planned itinerary of Western Caribbean is subject to change by cruise line with or without notice). Royal Caribbean’s suggested amount of $189 in ship gratuities per person included. Port charges, cruise ticket taxes and cruise ticket government fees also included. All other taxes and expenses, including but not limited to hotels, transportation, onboard incidentals, land programs and upgrades, any air transportation or upgrades, air changes, or any other additional expenses not set forth herein, are solely the responsibility of the Winner. Land programs and any upgrades may be purchased at an additional cost and will be subject to Royal Caribbean’s cancellation policy; please ask for details. The total approximate retail value of the prize is $4,900. Winner and Winner’s guest must both be 21 years of age. 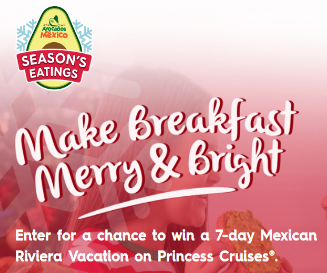 Avocados From Mexico® 2017 Season’s Eatings Sweepstakes – Win a cruise! Win a Mexican Riviera cruise for 4! ENTER SWEEPSTAKES HERE – Avocados From Mexico Sweepstakes page. ENTRY LIMIT – One entry per person/email address. 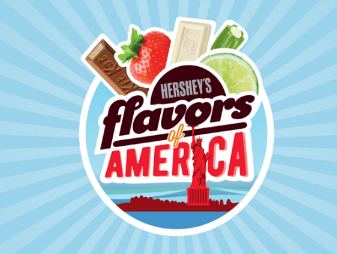 ELIGIBILITY – This Sweepstakes is open to legal residents of the forty-eight (48) contiguous United States and the District of Columbia who are age twenty-one (21) or older as of date of entry. 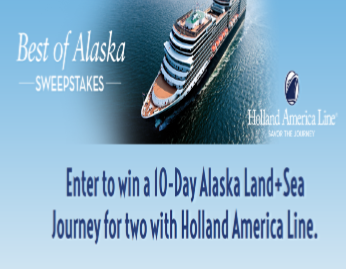 SWEEPSTAKES ENTRY PERIOD – This Sweepstakes begins at 12:00:01 a.m. Eastern Time (“ET”) on November 10, 2017 and ends at 11:59:59 p.m. ET on December 31, 2017.
to/from airport and the cruise port; and six (6) nights’ cruise accommodations (one balcony room with quadruple occupancy). Approximate Retail Value (“ARV”) of the Grand Prize: $7,278. Bed Bath & Beyond Oh, What Fun It is to Win! 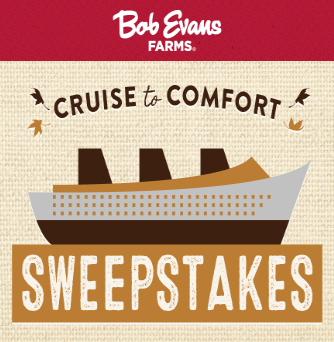 Sweepstakes & Instant Win Game – Win a Carnival cruise voucher & more! 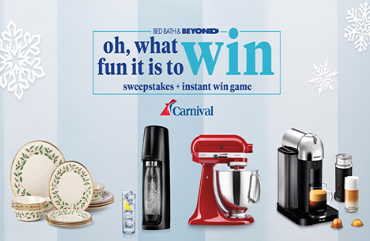 Win a $7,000 Carnival cruise gift card and a $1,000 Bed Bath & Beyond gift card! open only to legal residents of the fifty (50) United States (including District of Columbia), Puerto Rico, and Canada (excluding Quebec) who are at least twenty-one (21) years old or older at the time of entry. SWEEPSTAKES ENTRY PERIOD – The Promotion begins on November 6, 2017 at 9:00 a.m. Eastern Time (“ET”) and ends on December 22, 2017 at 11:59 p.m. ET. 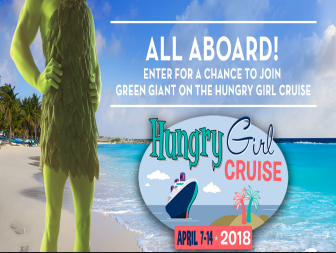 PRIZES – Sweepstakes Prize: ONE (1) GRAND PRIZE: One (1) One Thousand Dollar USD ($1,000.00 USD) Bed Bath & Beyond® Gift Card and one (1) Seven Thousand Dollar USD ($7,000.00 USD) Carnival Cruise Line® gift card, which winner can use to book travel and Carnival Cruise Line cruise accommodations of his/her choice.